A Wednesday video by an Arizona auto body shop professional describes a structurally compromised 2011 Toyota Camry following a botched collision repair. In the footage posted on YouTube, Matt Radman of Coach Works Auto Body in Mesa, Ariz., describes post-repair inspection findings done in conjunction with Collision Safety Consultants of Arizona co-owners Jan Vesely and Bob Isham. “We talked the customer into dropping off the vehicle, cause we did see a lot of areas where there was missing welds, poor welds – or overly welded in some areas — and some major issues with the structural part of the vehicle,” he says. One blatant error involves a more than 590-megapascal B-pillar reinforcement which has been cut along with the exterior skin, contrary to Toyota repair procedures, according to Radman. Alldata was used to confirm repair procedures, according to North Carolina-based Collision Safety Consultants President Billy Walkowiak. “The downside we have is they decided … to cut the structure halfway through, remove just the outer skin, and be able to put it back after they welded …in here,” he says. Unfortunately, rather than a continuous piece transferring the energy from a side impact as Toyota intended, it creates “really a shear point” that “ultimately could fail” if the Camry was T-boned, Radman says. The 2011 Toyota Camry’s repair procedures describe the intended crash energy flow and demonstrate Radman’s point. 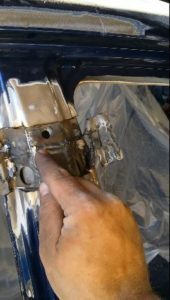 Poor workmanship can be seen on other parts of the vehicle, including at least one missing weld, exposed steel, a lack of corrosion protection, “opens and cuts” left by sloppy cutting, and a rocker pinch weld where “you can really see how this thing bows in,” according to Radman. He argues that sloppy work on the rocker and A-pillar could be life-threatening during a collision as well. “Definitely make sure your vehicle gets repaired correctly,” he says. Radman’s YouTube post indicates the vehicle was repaired by an unnamed insurance direct repair program shop, but any shop failing to follow proper OEM procedures could also be having a “there, but the grace of God, go I” moment with such post-repair inspections. Such errors not only jeopardize one’s customers, but also one’s reputation and wallet. To paraphrase Tom McGee of Spanesi, how many $10,000 2011 Camrys can you afford to buy back?